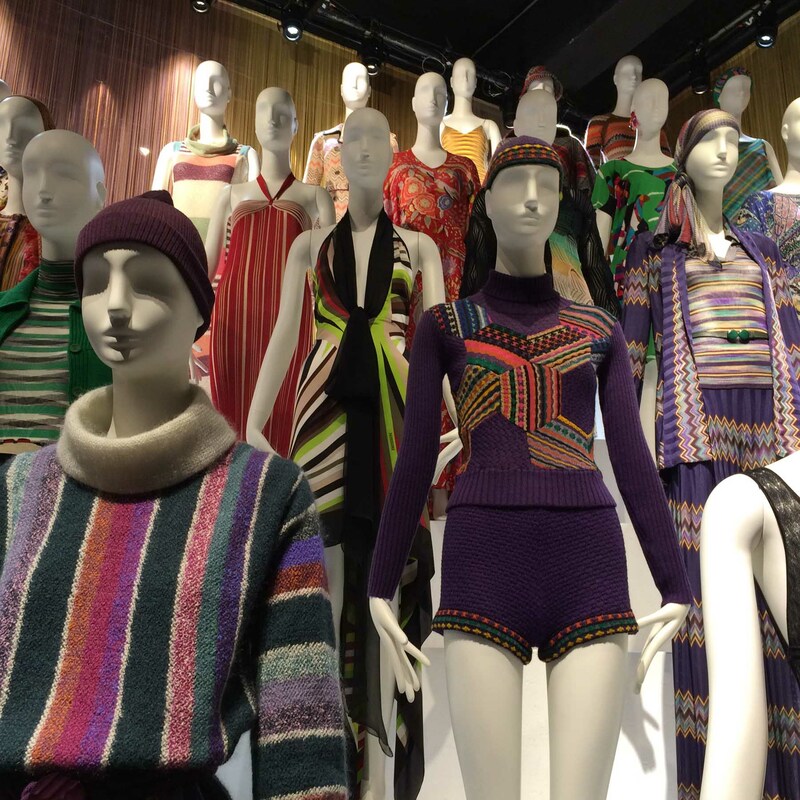 Earlier this week, I travelled to London to see the Missoni exhibition in the Fashion and Textile Museum. 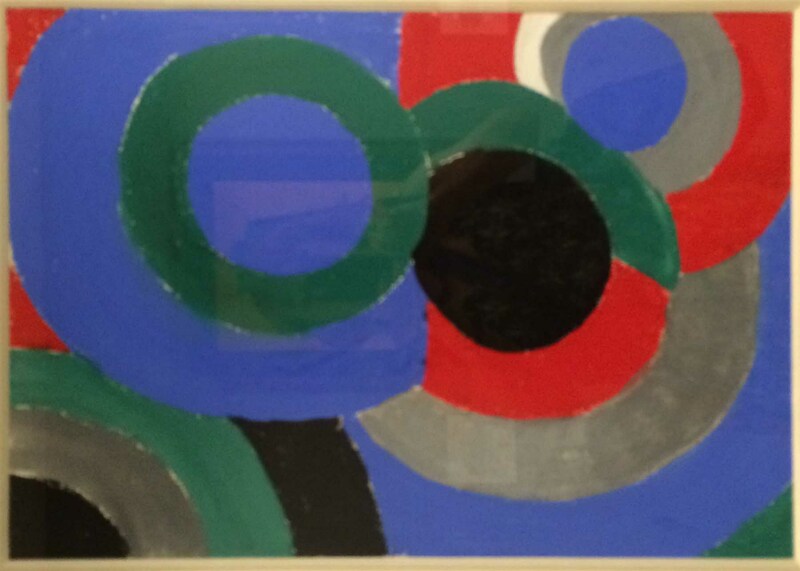 I wasn’t surprised to see that Ottavio loved Sonia Delaunay (her 1936 Senza Titolo here). 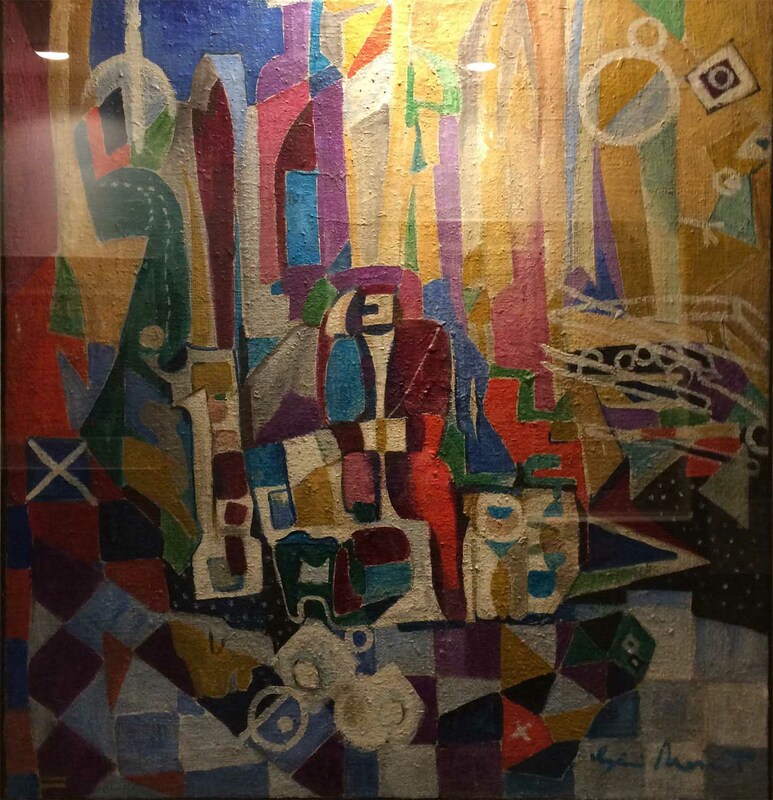 And Gianni Monnet’s 1946 rich and textured Costruzione also sits well with the Missonis’ work. From the corridor, you step into a big, dramatic room. 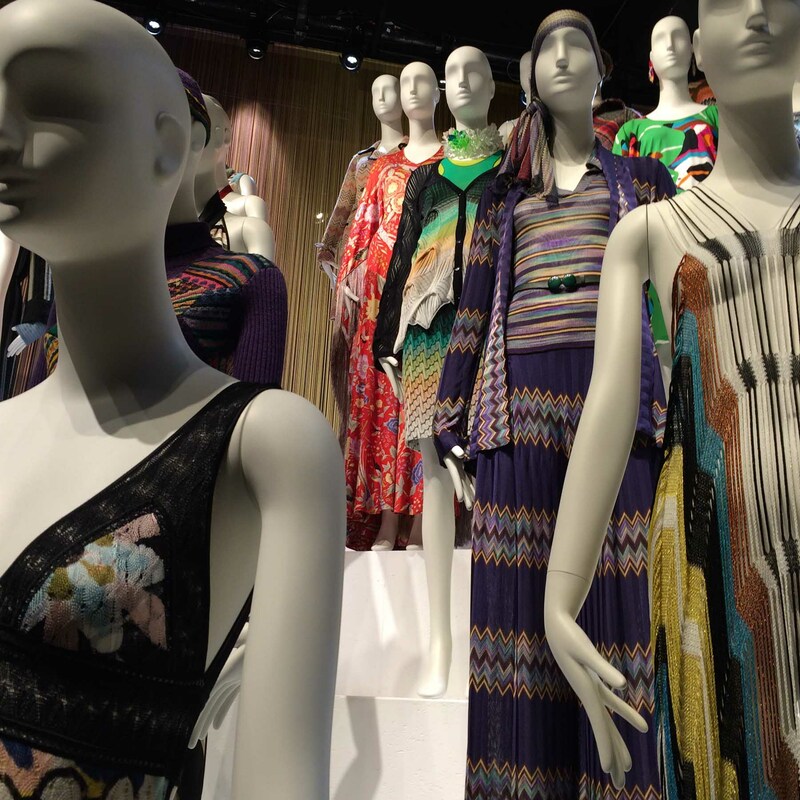 First thing, you notice the mannequins. 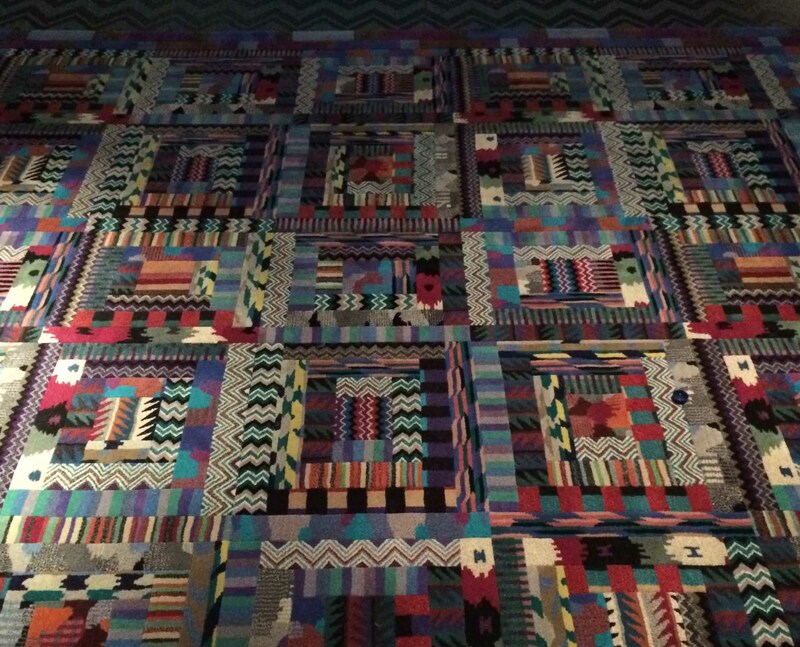 And then you take in the huge patchworks of knitted pieces hanging … … all around the room. These are the most stunning pieces, and, best of all, it’s possible to get up to them quite closely to study the construction. They really do appear to be sewn together, but aren’t lumpy at all. 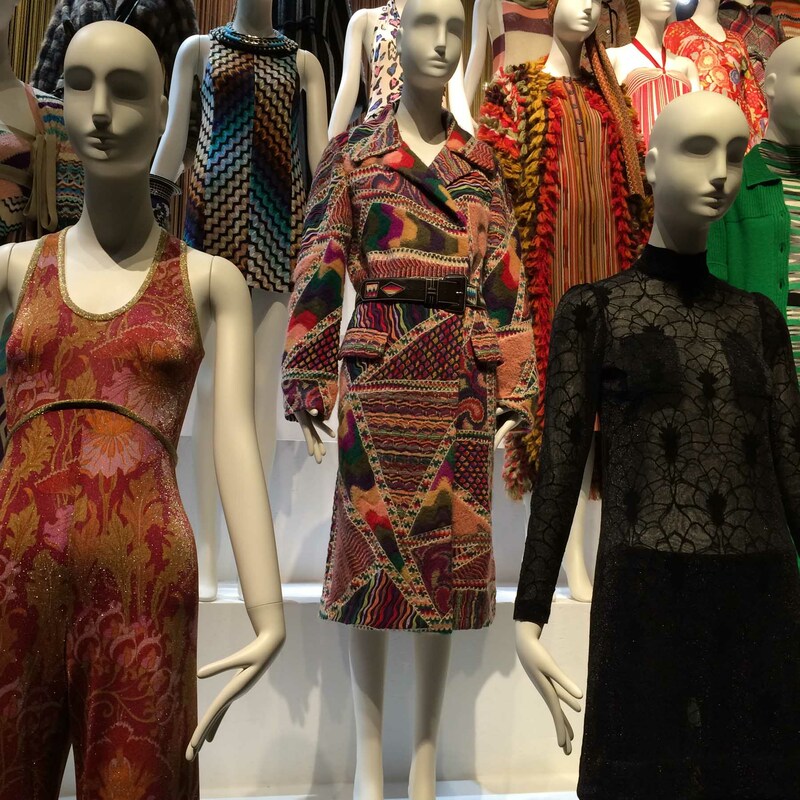 Now back to the mannequins – they are amazing – where to look first? The purple short jumpsuit, perhaps? 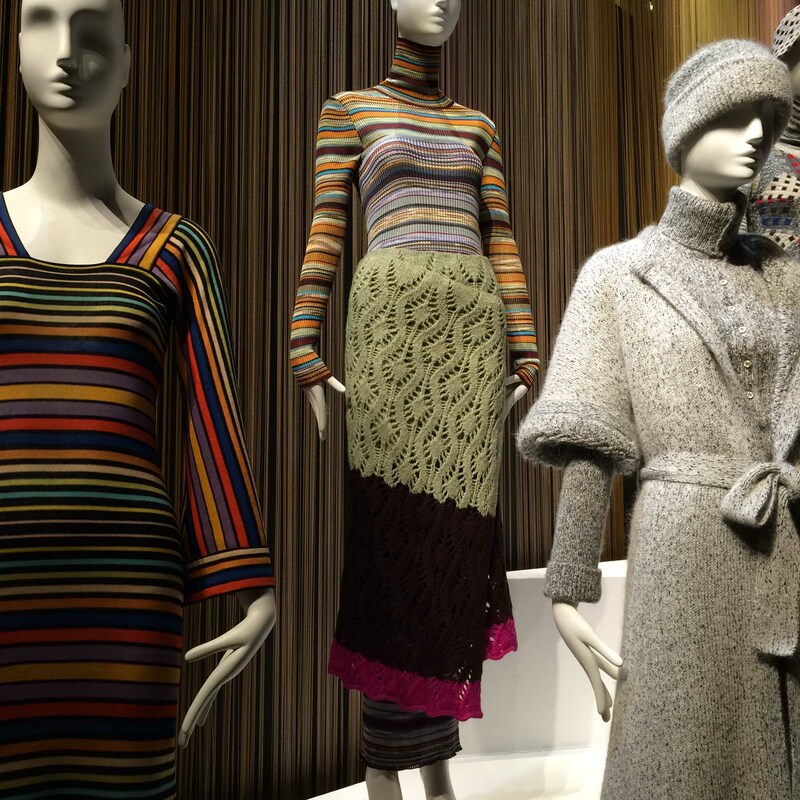 I read elsewhere in the exhibition that Ottavio Missoni considered purple a wonder colour because it went with everything. That’s quite different to my thinking, so gave me pause to reflect. What is really striking in this garment, of course, is those patterned hexagons on the jersey top. What about the elegance here?! Those fluid lines with the extra black gore panels so perfectly inserted, and the skilful way the pattern sits on the body! What a gorgeous and flattering dress to wear! Such an interesting dress here – the construction! 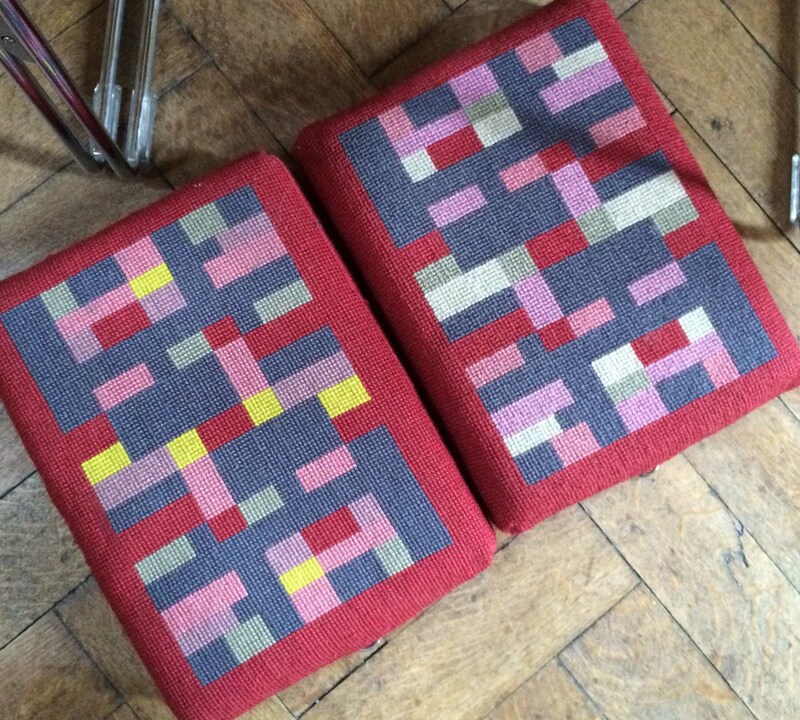 Surely my machine-knitter husband could copy some of these for me?! 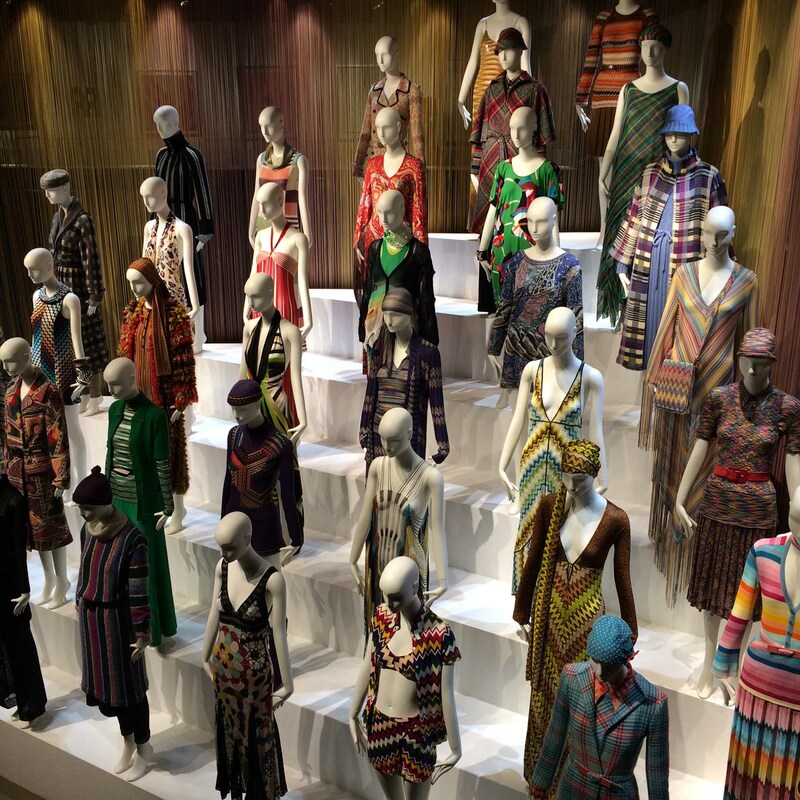 Trademark Missoni zigzags here! Just take a more careful look at that dress glimpsed behind the zigzag pant suit – it’s actually mostly made of unconnected threads. You’d have to be an Elizabeth Hurley to wear this dress. 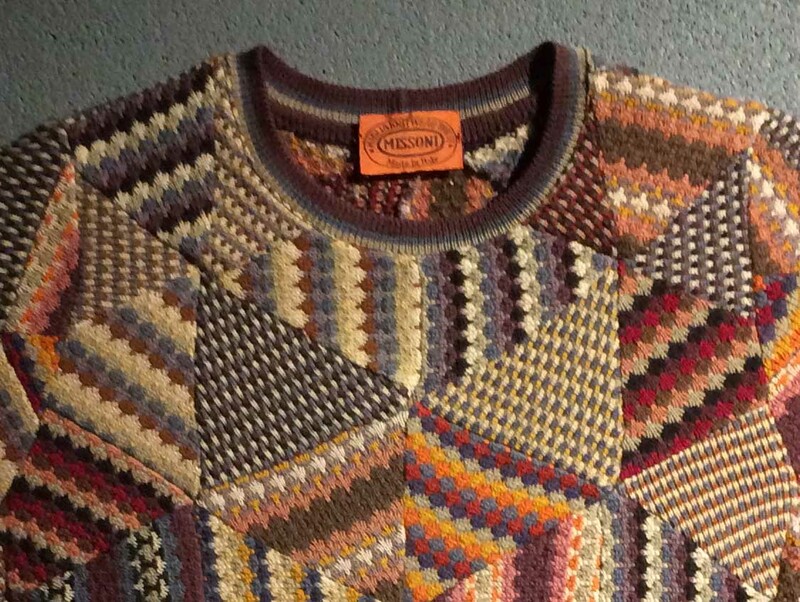 Here’s one of my favourite garments, – this gorgeous multi-coloured, multi-patterned coat. Or is it? There’s that red dress – right at the top – that I really like. Can you see the one I mean? Still trying to see more of that red dress … but now we come to one of the faults in this exhibition – you couldn’t see the the back of the whole display properly, nor could you see the backs of the individual garments. Would anyone notice if I leapt quickly up the stand? That wasn’t the only tantalising thing with this exhibition. 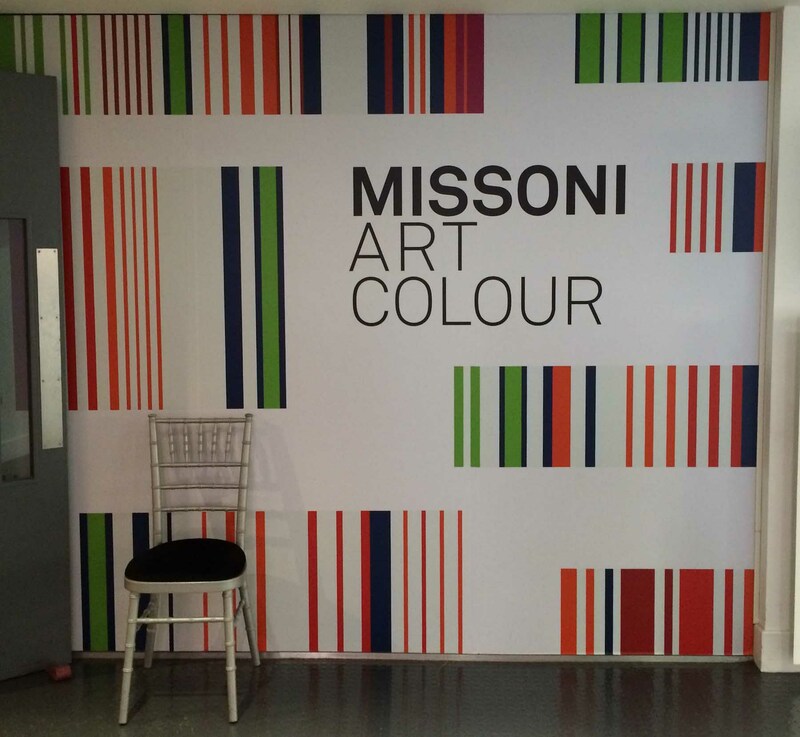 I rather think the exhibition designers had got carried away with their exhibition designs, forgetting the point of the exhibition was to showcase the Missonis. They had programmed the lighting on a loop which travelled constantly from highlights here to there, from dark, to shade – to finally (oh, thank heavens!) light all around. Take a look: Stylish and cool it may be, but b***** maddening! Upstairs I was distracted from my irritations by the abundant and sumptuous examples of pattern. 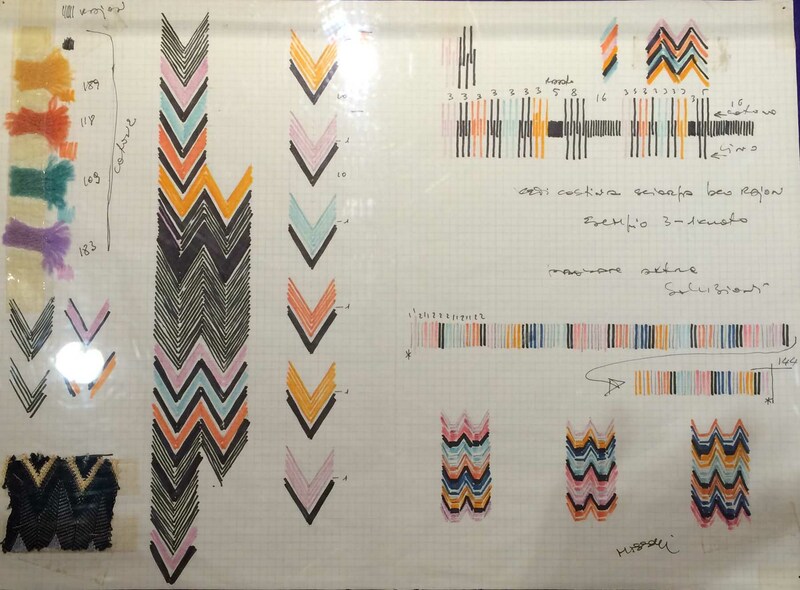 These are Ottavio Missoni’s basic studies for designs. 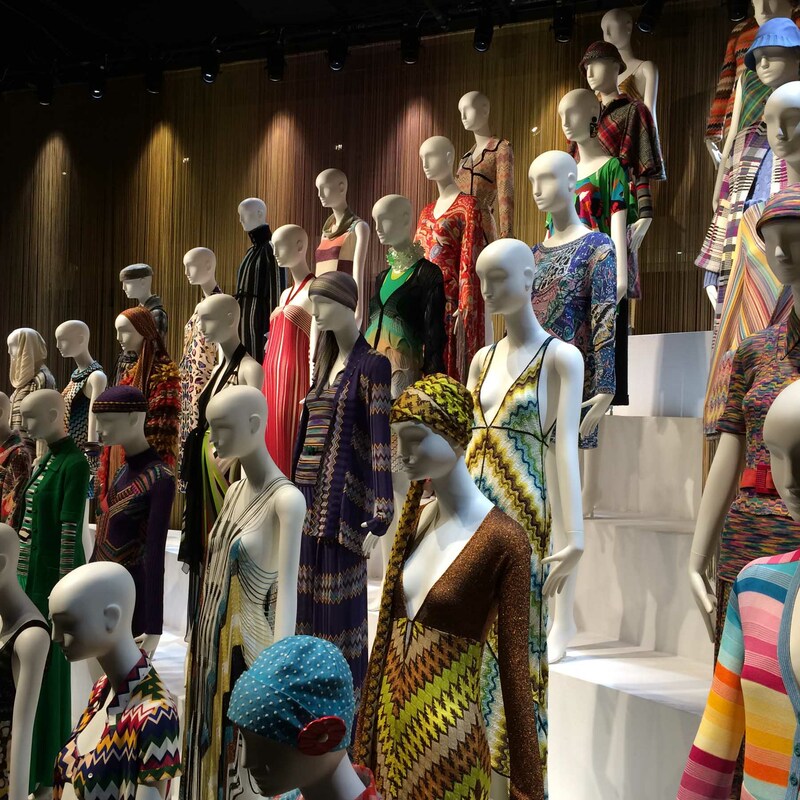 You can see how he takes simple graphical designs such as a child might do, and develops them into the fabulous patterns we associate with the Missoni brand. I particularly love the way he completely shifts his colour palette here. 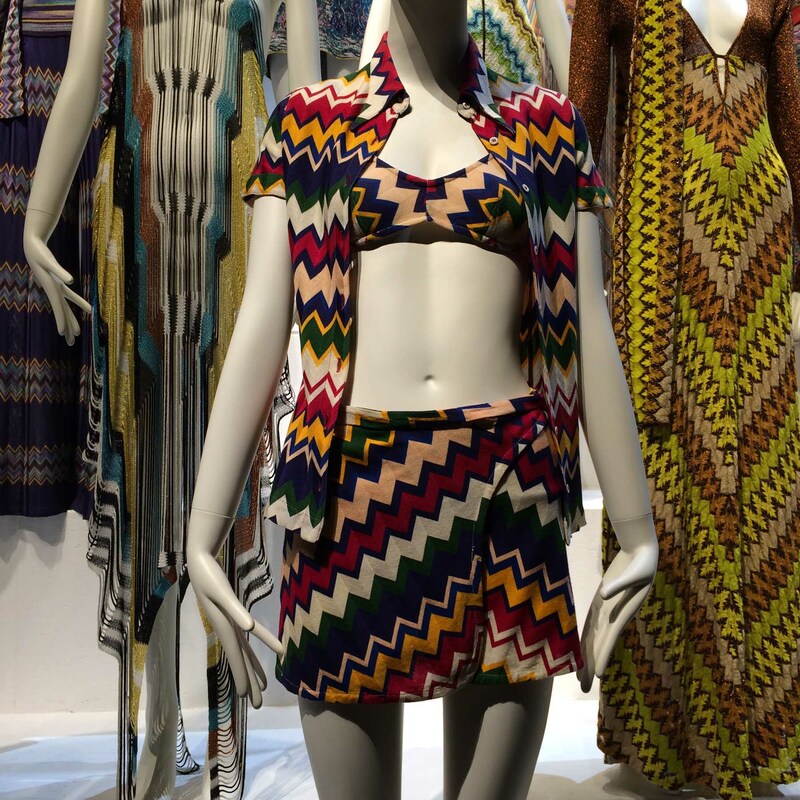 Missoni zigzags. 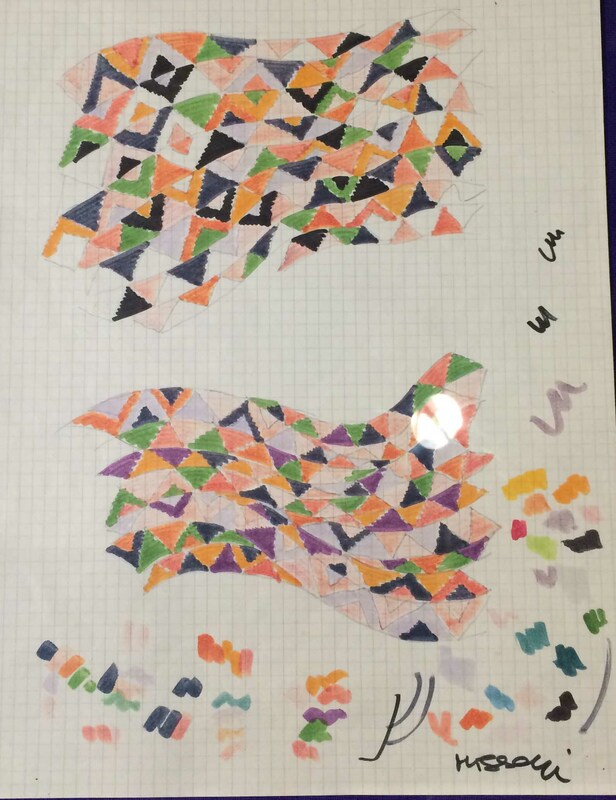 And this piece breaks out of the constraints of the grid to flow and ripple. 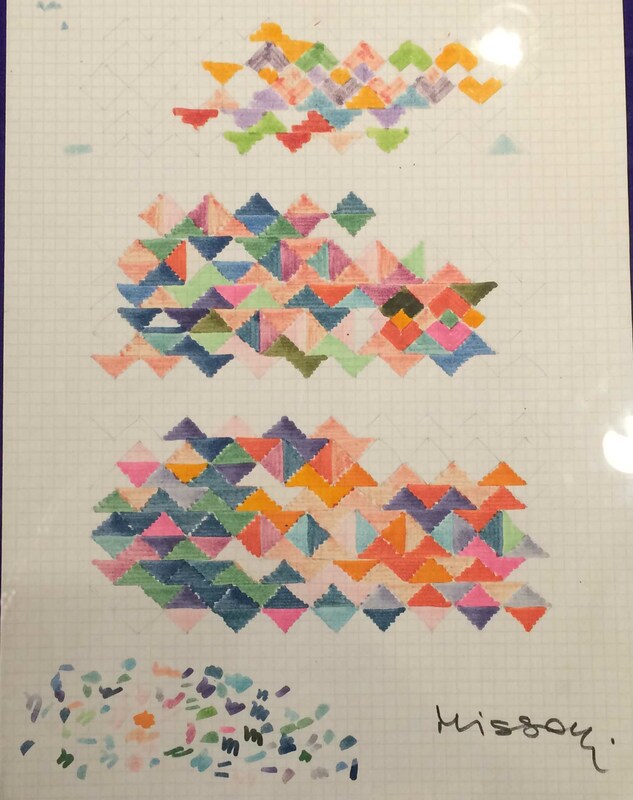 As well as these “starter” pieces, there were swatches. Detailed labelling was missing, but I guess some of these pieces became garments … and others were just put to the side. Such a fabulous design resource here! 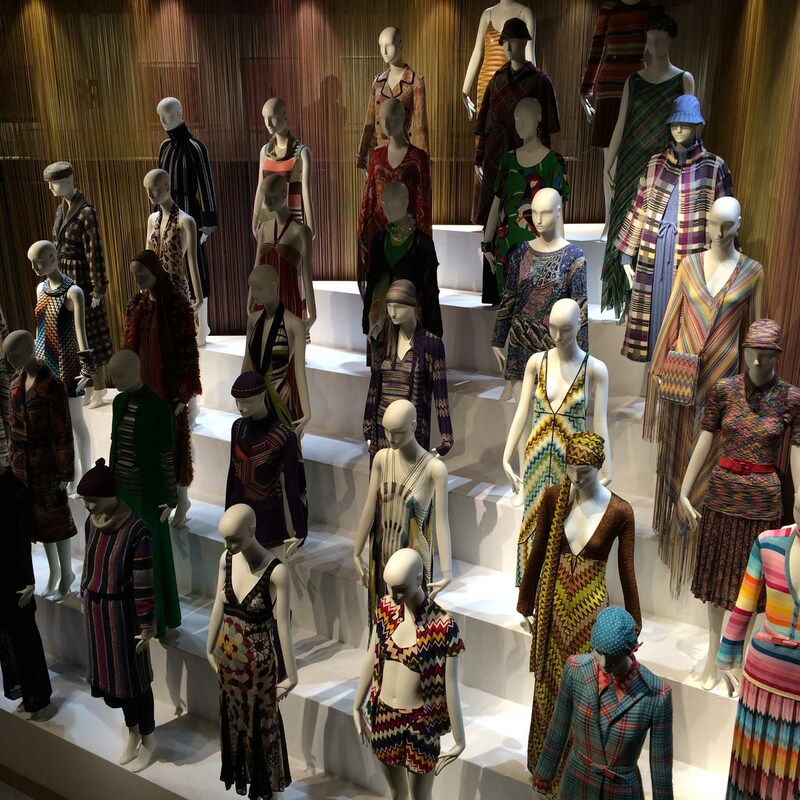 If you make garments, you will naturally be interested in not just the colourful patterns the Missonis designed, but the construction of the finished garments too. 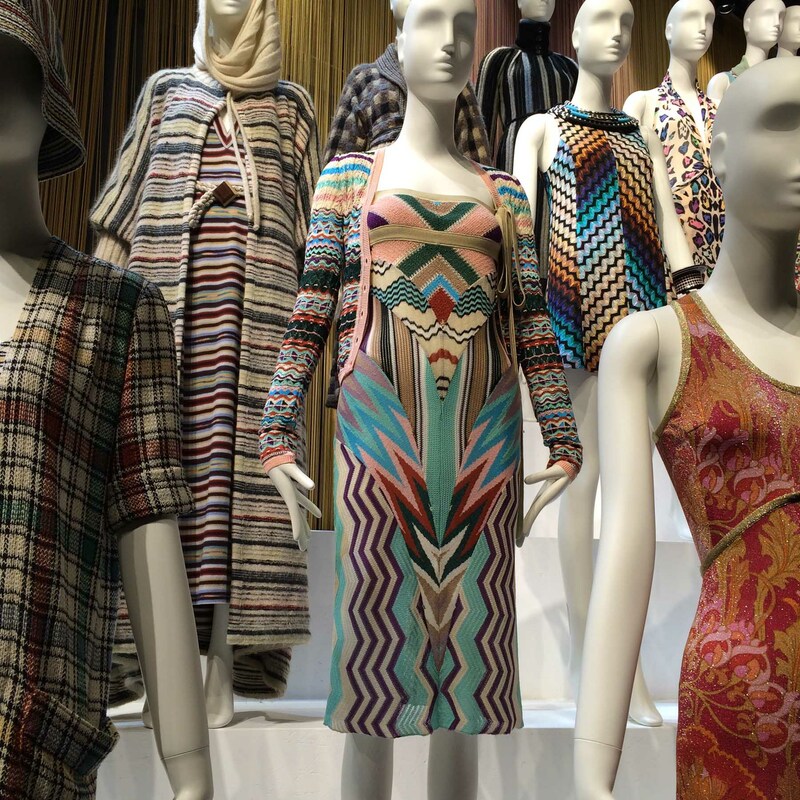 So hard to see how those gorgeous clothes on the mannequins were constructed, but there was one Missoni jumper in a case upstairs which gave an interesting glimpse of how it was made. If you look carefully at the detailed photo, you can see that it’s a patchwork! I cannot imagine how machines coped with this work – or was it hand done? I would be very hesitant to embark on such a work lest I get lumpy knitwear seams, but no evidence of that here. It’s a stunning garment. 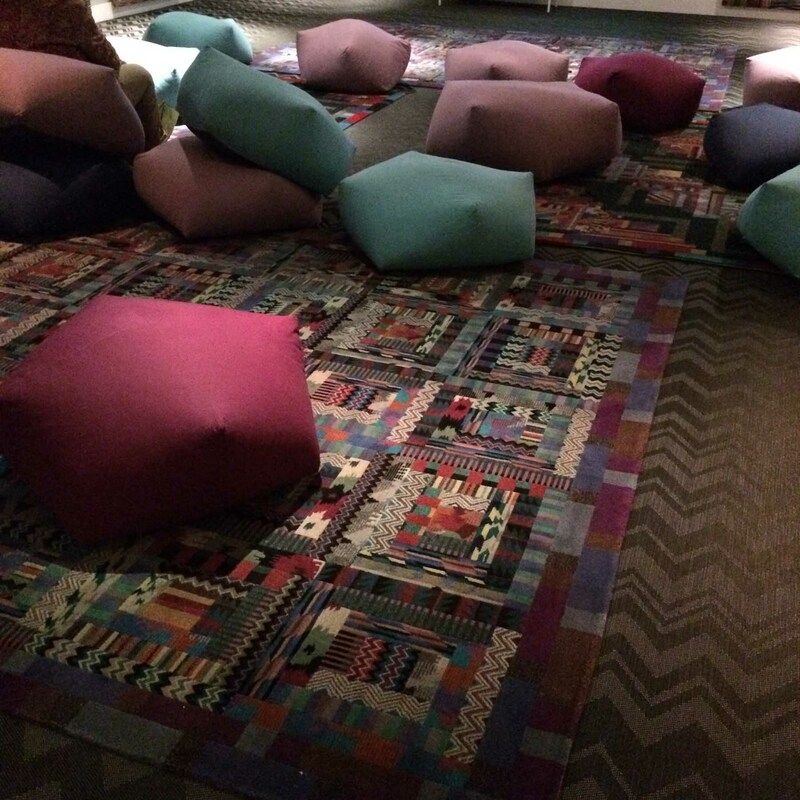 Finally, the exhibition took you to a room furnished with Missoni carpets – oh, wow! 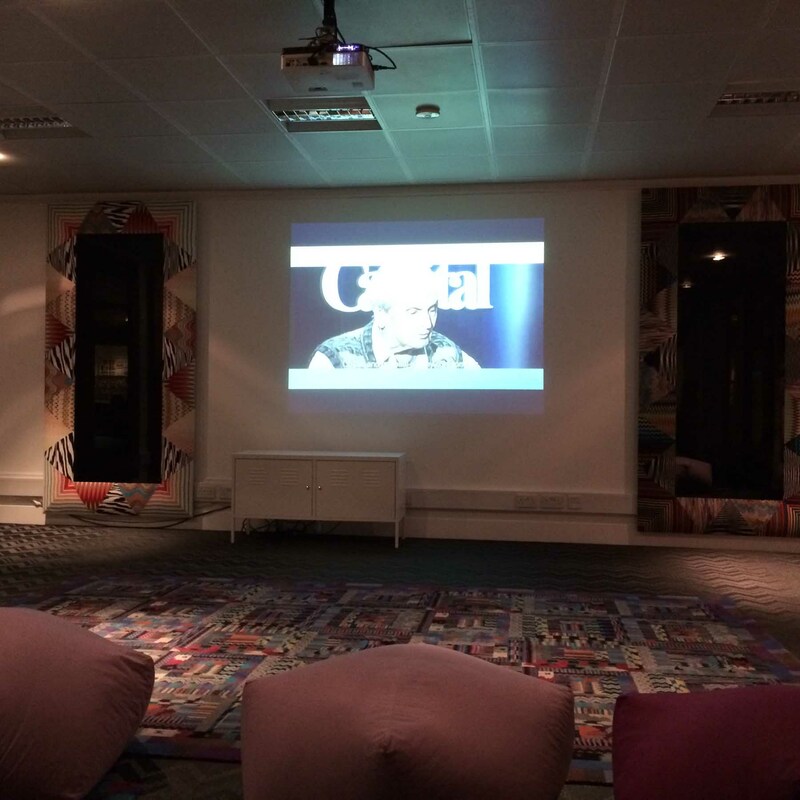 A really lovely space to sit down and watch the Missonis talk about their lives and work. What came over most strongly was the warmth between Ottavio and Rosita. This lay behind their successful business – and radiates today through the younger generations who currently manage the business. 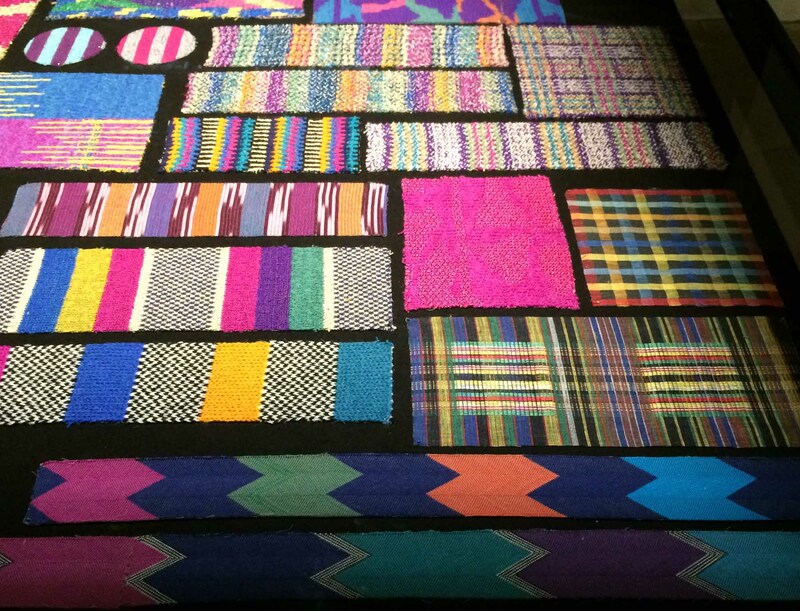 A parting shot of the carpet in detail. 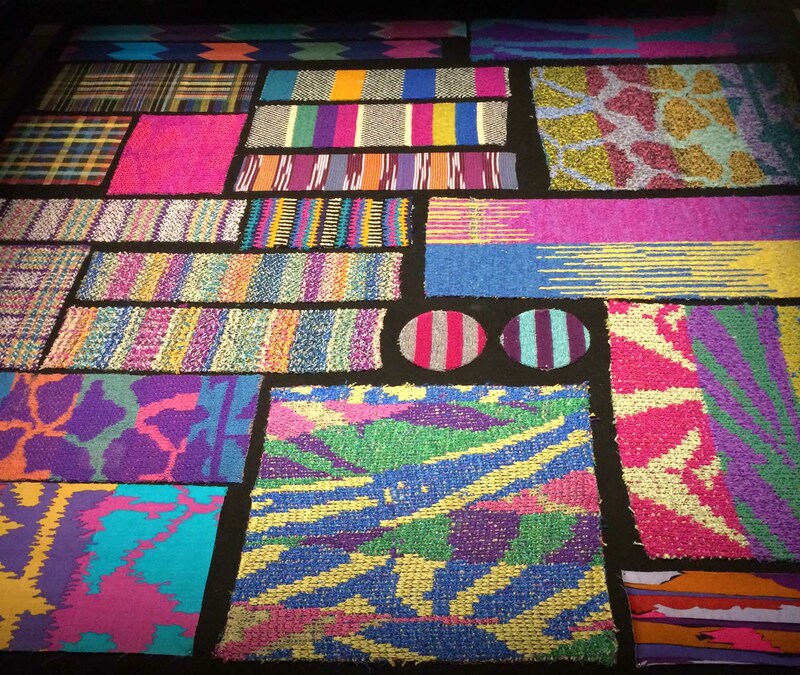 I had a good look at these carpets and they are not made of separate pattern pieces seamed together – they have been woven as one continuous, flowing pattern. Remarkable! 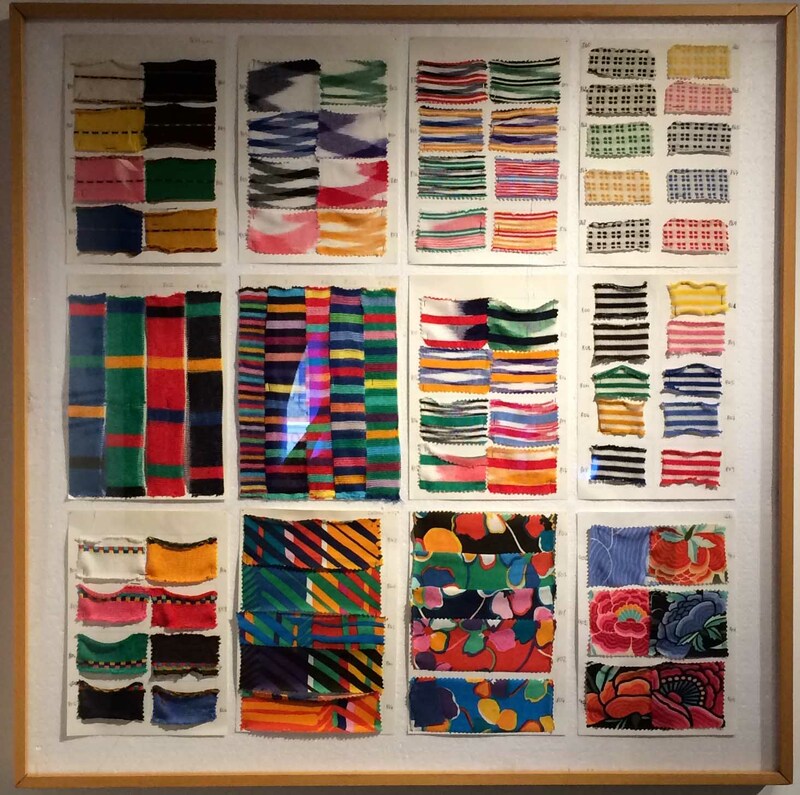 Whatever my complaints – a wonderful exhibition. 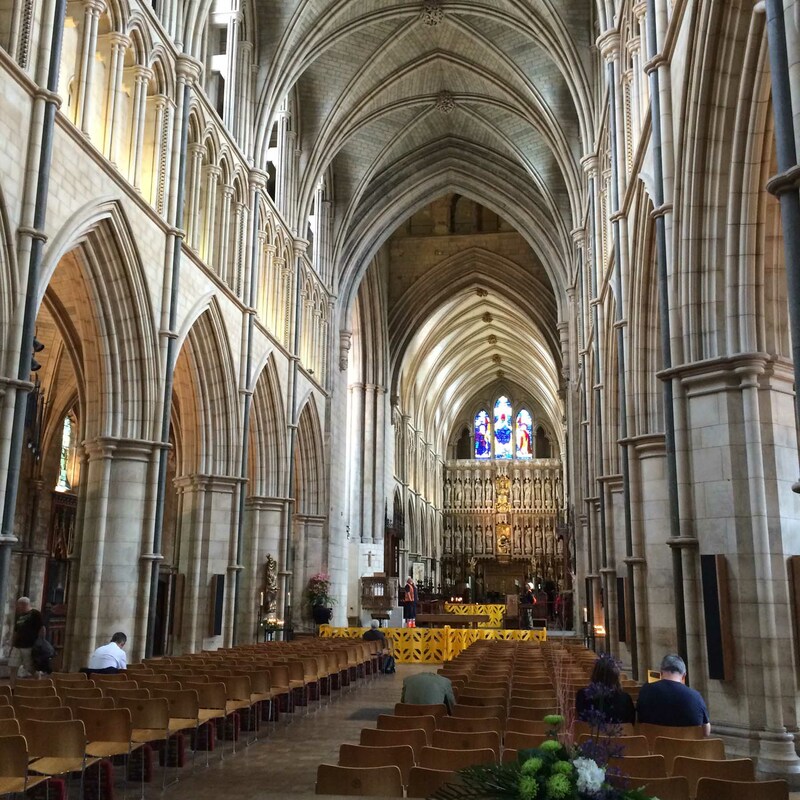 I’m just greedy – wanted to understand more. 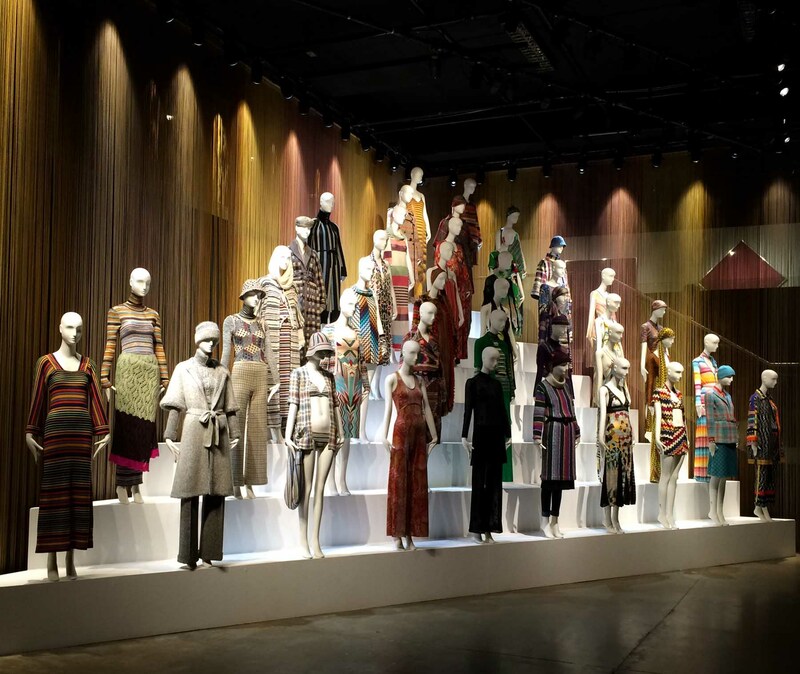 A final piece was a film by Turkish artist Ali Kazma showing the Missoni factories at work. 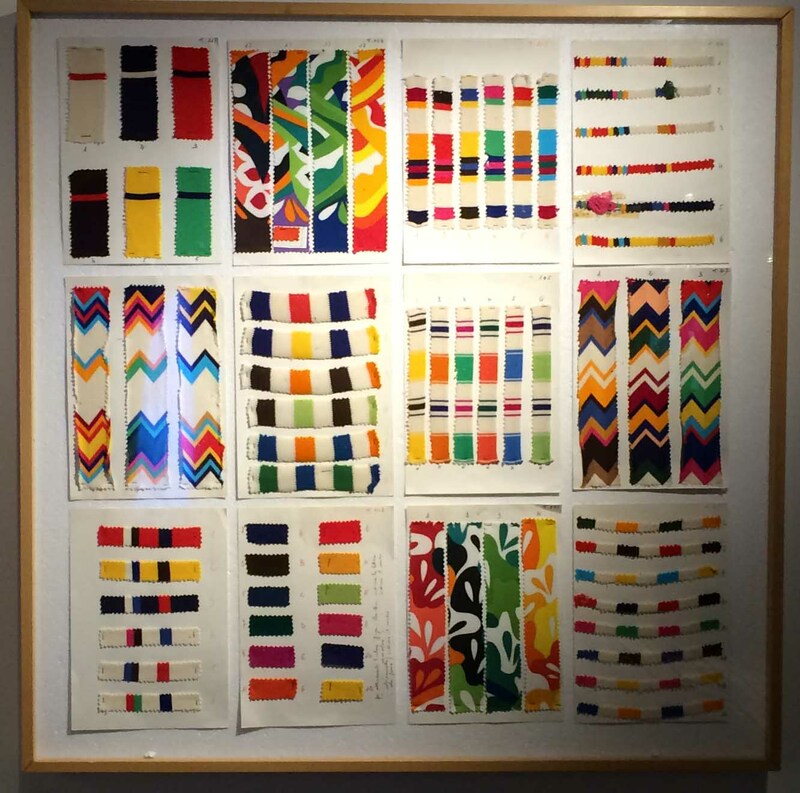 This was important because I think we need reminding that this wasn’t just genteel playing with colour and pattern – this was an extremely successful business functioning with super speedy, super efficient and super sophisticated machinery. Interesting exhibition, despite its annoyances. There’s nothing like getting close to a garment to see how it’s constructed, though I always want to reach out and touch. 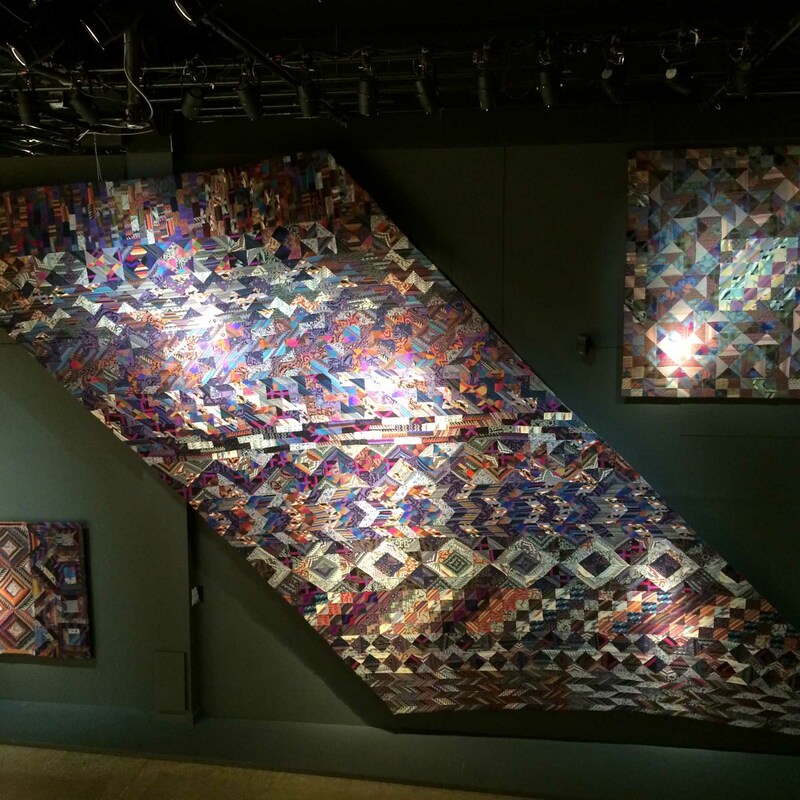 Oh yes – I so long to touch exhibits, especially at this exhibition! Clearly, human beings never lose that yen for tactile exploration that small children demonstrate! Thank you for a fabulous virtual visit! 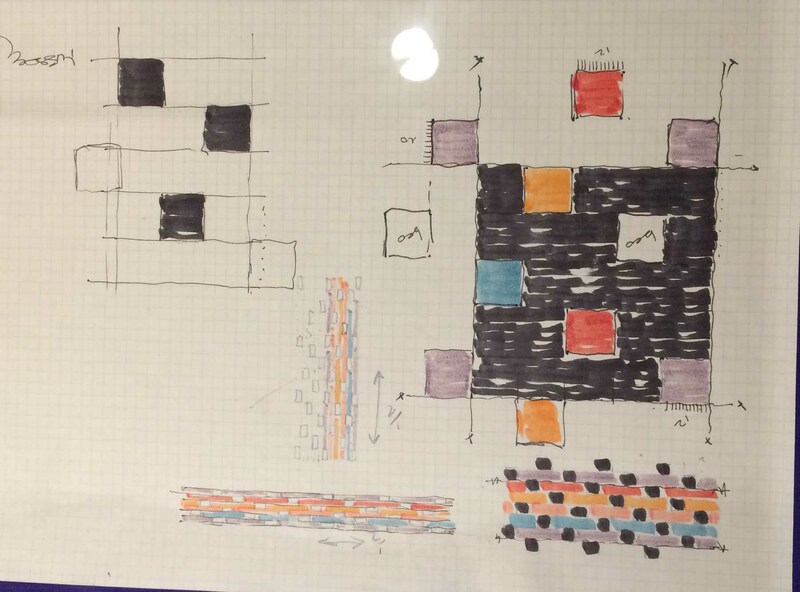 I understand about the frustrations of the lighting loop — many times lately I have been in an exhibit where I wanted to spend more time, but the very short audio loop of music and sound bites drove me out! 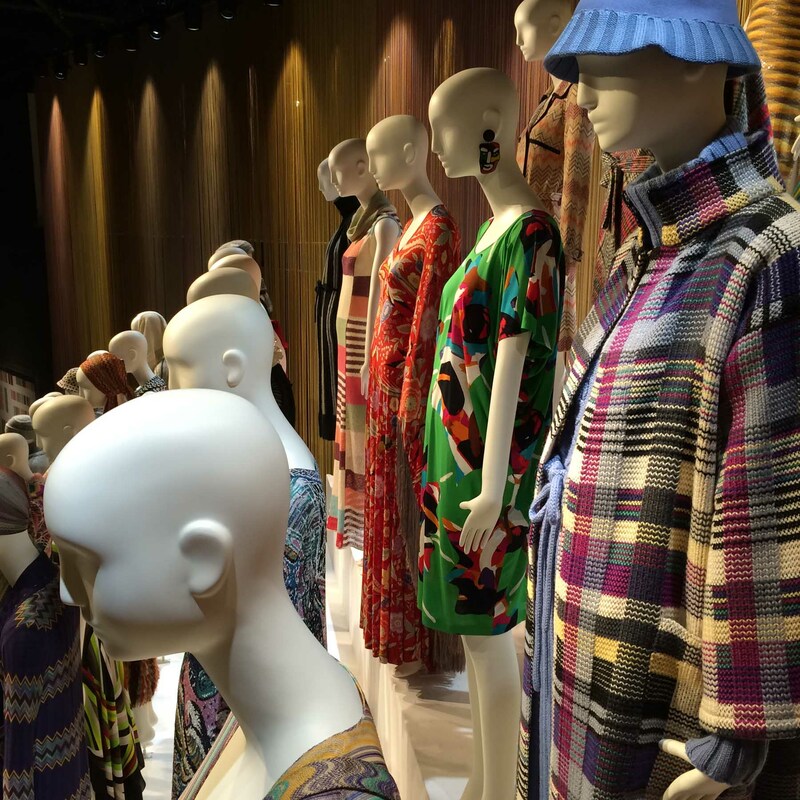 Which may be what the display designers wanted, to move people through, but these were not in exhibitions that were heavily attended. I also went to a Leonardo da Vinci exhibit where the sound track was all piano, which drove me crazy because the piano was not invented in his time. But this exhibit looks so inspiring. My favorite is the panel top right behind the dress you want your husband to copy for you. 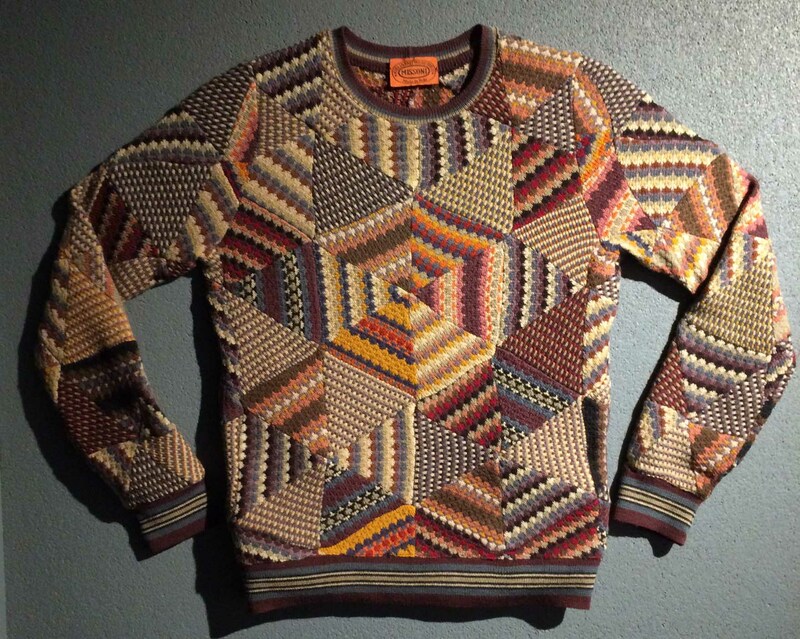 That looks like a design that could be done in handwoven fabrics and could be worn anywhere. I love the swatches too! 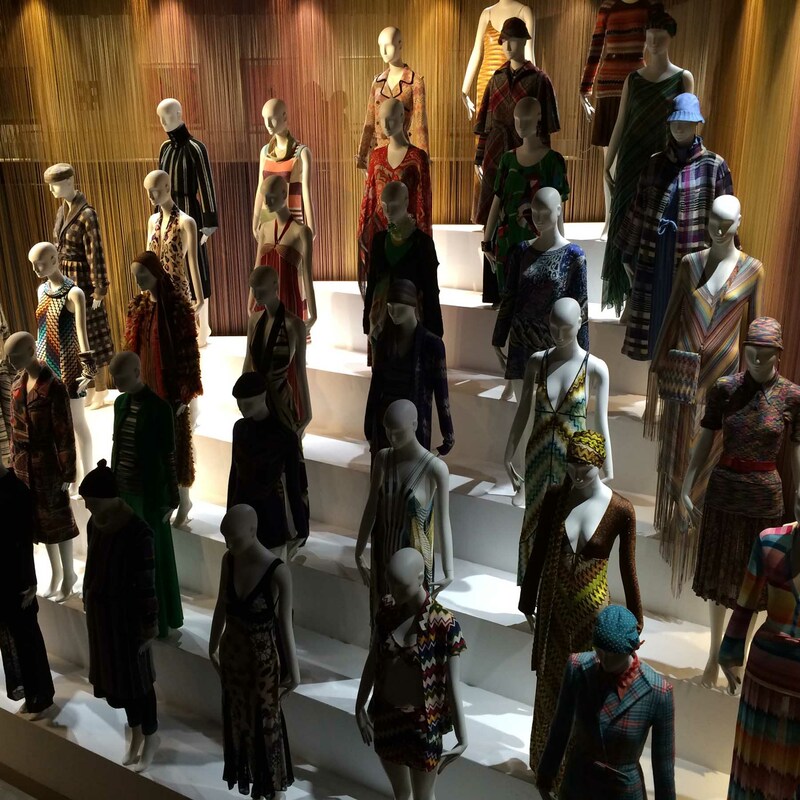 So glad you enjoyed this virtual exhibition! crazy to think about all those badly designed exhibitions that are just exhibition designers indulging themselves. There are just so many ideas that I found inspirational here which was one of the reasons I wrote such a detailed blog: I really wanted a reference for myself in the future. 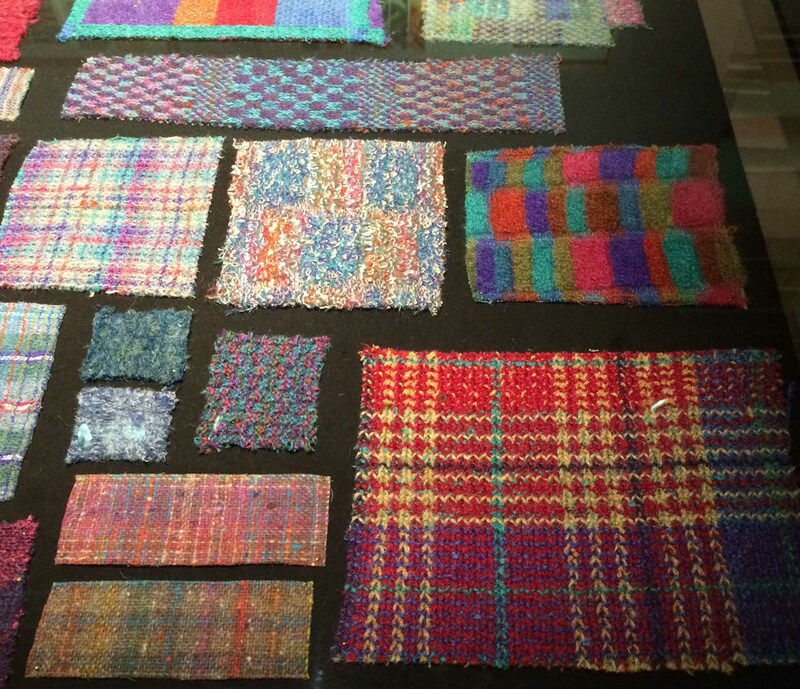 Really interesting to read what you say, Susan, because I’d love almost any of this stuff in my house (probably a very small version of the carpet!). I reckon the world splits into those who wear pattern and those who wear plain – and I am the former. 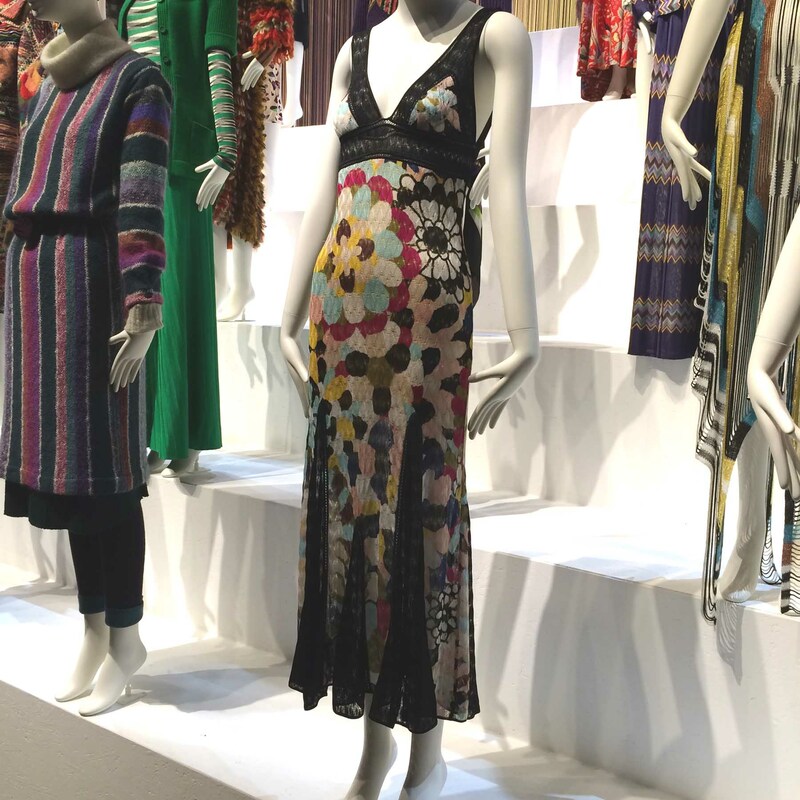 I have so few clothes that do not have patterns on them – and many of them are strong designs, perhaps not as startling as the Missonis but certainly striking. Would I be right in guessing most of your wardrobe consists of plain-coloured clothes?! Not that I don’t like plains, but I really feel uncomfortable in them. 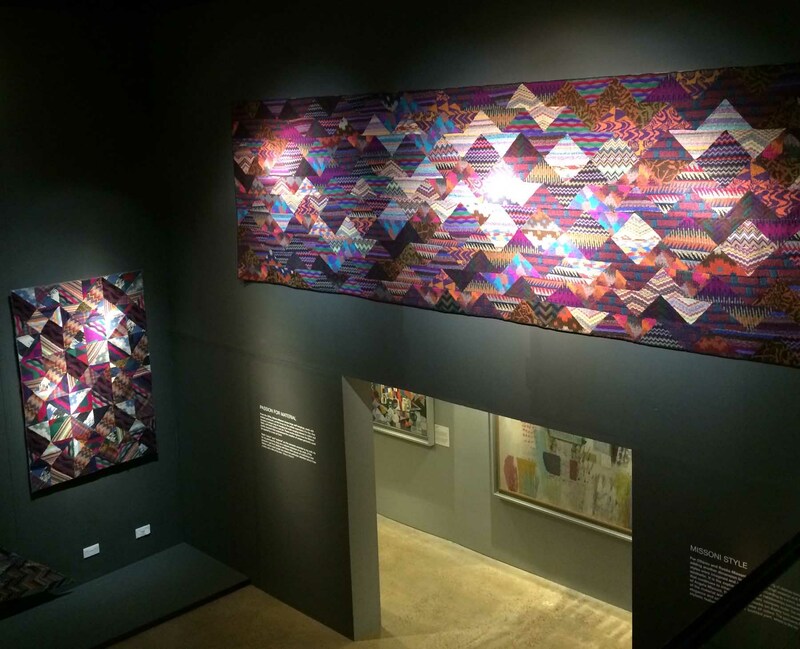 An exhibition after your own heart, Katherine! The Missonis were new to me. I could certainly live with that carpet! And could see you wearing some of those clothes – definitely get Stephen onto it! Must get to this museum. Glad you enjoyed it, Polly! Just wonderful, wonderful abundance and exuberance. I don’t often feel so impressed by an exhibition that I want to document it so thoroughly, but this one I thought was exceptional – so if you’re in the area do go – think it ends in September. 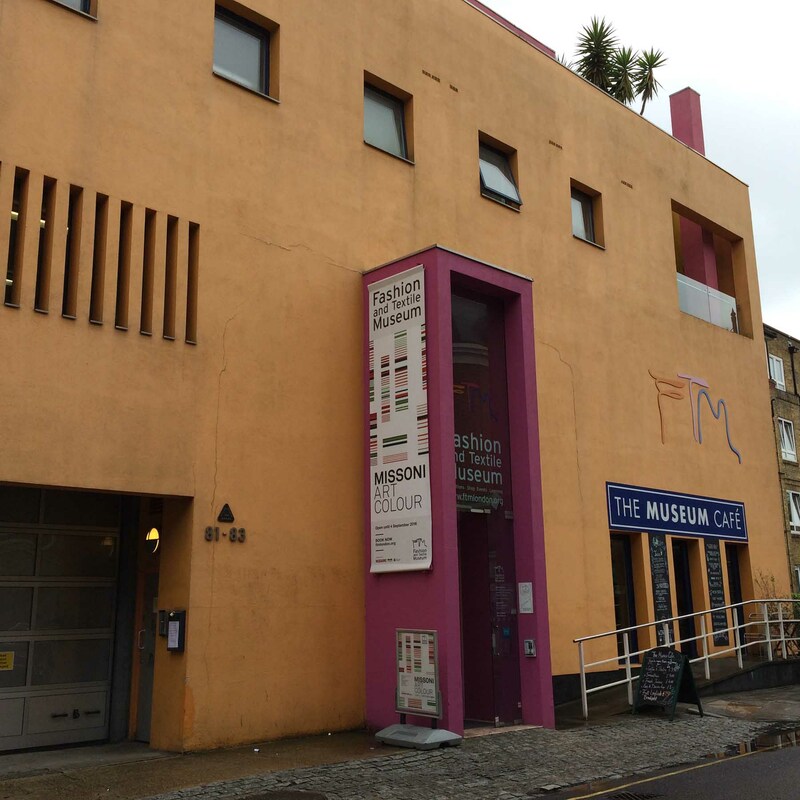 PS I see it’s in Bermondsey, which is now on my mental map after visiting Jeremy’s gallery. [J+D] As ever, your post is full of interest and enthusiasm. We hope one day to be in a position where we are producing less, creating more. 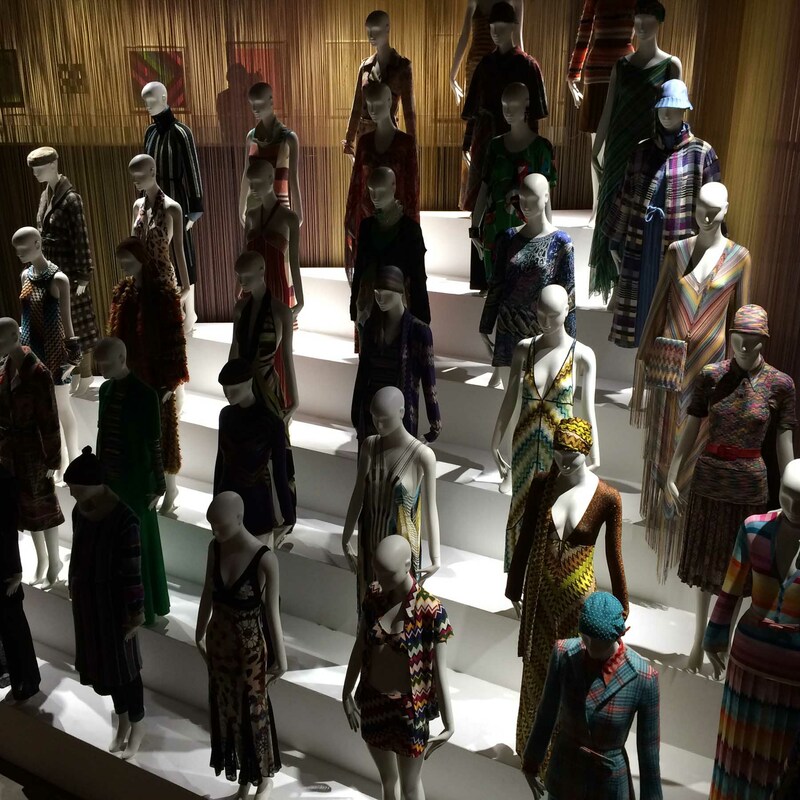 We might even find the wherewithal (funds, of course, but also the courage to face the thronging metropolis) to visit the Missoni exhibition, the V&A and other such. Thanks for visiting on our behalf! Yes, the metropolis can be daunting after our quieter countryside lives. I write as Stephen is on a very crowded train, travelling back speedily (I hope) from London, after complaining loudly about everything there! I have to say that this was one exhibition that I knew I could not miss – and I am so glad to hear you enjoyed the virtual trip.